Guess what my Christmas present is? Here are some hints: It is big, long, and bouncy. This is a very helpful hint. READ ALL THE WORDS! First, you try to balance on the the thing you stand on. It might be hard at the beginning, but you will get better. Second, when you get better, you try to bounce. Be sure to wear a HELMET! Third, when you almost mastered bouncing, try to beat your high score. Do it like your are trying to beat your high score on a game. Do you celebrate Christmas or Hanukkah? It sounds like you had a very fun Christmas. You look fantastic on the pogo stick. I have never tried a pogo stick, however it looks really fun. Was it hard to learn at first? Did you fall in the beginning? Congratulations on getting your own blog! What a wonderful way to spend a Christmas morning. I am sure you had a wonderful time bouncing on the pogo stick. I love to do that too! Congratulations on your new blog! I like your colorful background. I am glad you included safety equipment in your pogo stick directions. It is important to wear pads so you don't get hurt. 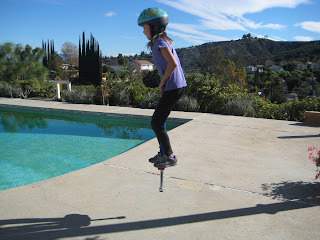 When my daughter, Mara, was 7 years old, she got a pogo stick for Hanukkah. She liked to count how many bounces she could do in a row. I don't remember her highest number, but it was really high. She could bounce much better than I could. I am going to draw a conclusion. You celebrate Christmas. 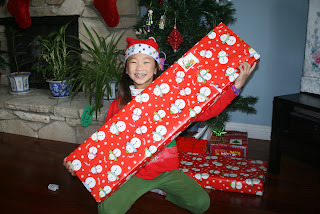 The clues are: you had a Christmas hat on and the wrapping paper was cover with Santa. It is amazing to get a good picture when you are hopping. That is neat. Your pogo stick sure looks fun! I wish that I had gotten a pogo stick for Christmas, but instead I got roller skates. I also got many other things but I do not want to name them right now. Sometimes I wonder what other people got for Christmas. 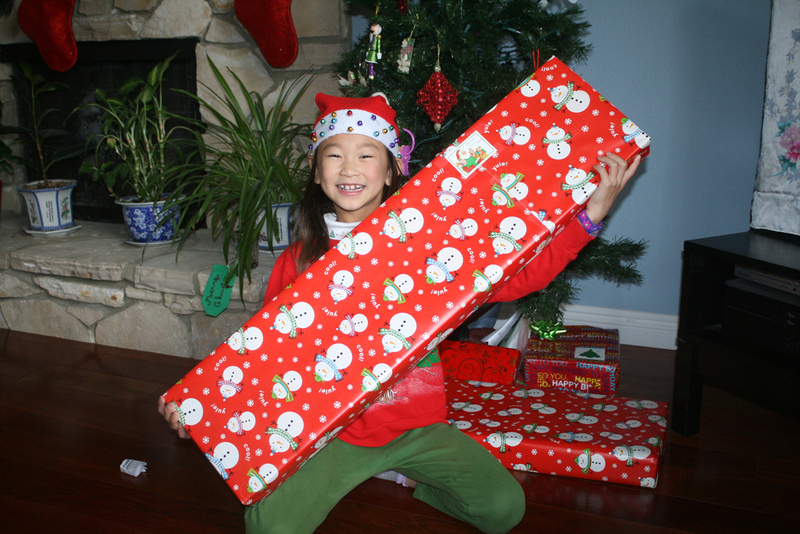 Do you sometimes wonder what other people got for Christmas? It is that time of year again! Yes, Christmas! I already typed out my Christmas list on Microsoft Word, and sent it out to anyone that is coming to my family's Christmas Party. One thing on my list is The Series of Unfortunate Events series. I have so many other things like: clothes, toys, art supplies, earrings, shoes, etc. What are some things that you want for Christmas?